Popular LA bakery Sprinkles, which launched a cupcake ATM Stateside, is bringing the device to the UK so that shoppers can get a sugary fix at all hours of the day. Sprinkles, which is said to be considering a number of different locations in London to install the machine, churned out up to 1,000 cupcakes a day when it opened the same facility in Los Angeles – and even reported that the machine crashed because of high demand. 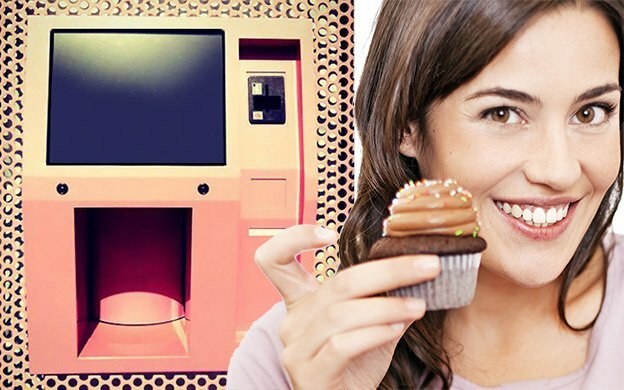 The ATM would be continuously restocked throughout the day and night with a choice of eight cupcake flavors at any one time, priced at around £3.50 ($5.50) each. Nicole Schwartz, head of marketing at Sprinkles, explained that the machines can hold up to 600 cupcakes, and any cake dispensed will have only been baked a couple of hours earlier. She told The Atlantic at the time of the LA launch: “The machine is attached to our bakery, which is essentially a 24-hour operation. By the time our closers leave at night, it’s 11:00 p.m. and our bakers arrive in the wee hours of the morning (2 or 3 a.m.!). Whether the London machine will stock cakes for dogs too, like its LA counterpart is as yet unconfirmed. Sprinkles in LA decided to stock the pet treats because health department regulations do not permit dogs in the bakery she explained, “so you don’t have to tie up Fido while you head inside”. Sprinkles is as famous in its American birthplace for its A-list fans as it is its buttercream-frosted treats. Heidi Klum, Blake Lively and the Kardashian sisters have all been spotted in its stores (though quite how they eat cupcakes and maintain those bodies is anyone’s guess). And since The Great British Bakeoff hit screens, cupcakes are certainly in fashion on this side of the pond too. Cakes, in flavors such as cinnamon sugar and chocolate coconut, sell for $3.50 each (£2.15) or $39 per dozen (£24) in the States, and prices are likely to be similar when the cakes launch in the UK.